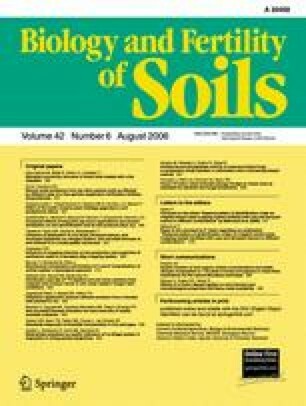 Effects of application of rice straw (RS), farmyard manure (FYM), municipal biowaste compost (MBCom), and municipal biowaste charcoal (MBCha) on soil microbial biomass N, mineral N, and nitrogen-fixing activity (NFA) of a model paddy microcosm were examined in comparison with urea fertilizer. When microcosms were added with urea, NFA decreased with increasing rates of fertilization, and it was negligible (less than 4% of the control, no urea fertilization) in the soils treated with more than 60 mg kg−1 urea–N. The addition of RS, with the highest C/N ratio among the organic wastes used, stimulated N2 fixation most effectively (40% increase compared to the control). MBCom, with the lowest C/N ratio and a comparable mineral N content to 60 mg kg−1 urea–N, decreased N2 fixation (50% decrease), but it was not markedly suppressed unlike urea. In spite of the fact that FYM contained a relatively large N, expressed as low C/N ratio, its effect on N2 fixation was small (14% decrease). FYM and MBCom did not stimulate NFA as RS did. This may be explained by the fact that N concentrations of microbial biomass N and available N were higher in the soils than in soil treated with RS. The effect of MBCha addition on N2 fixation was small (14% decrease). The present study demonstrated that organic wastes might affect N2 fixation depending upon the amount of available N in the waste-treated soils, but that organic-waste-treated soils generally support higher N2 fixation than chemical-fertilizer-treated soils. The authors thank Dr. Ezawa T. and Dr. Matsumura S. for providing FYM and MBCom, respectively. A part of this study was financially supported by the TUA&T 21 Century Program (Evolution and Survival of Technology based Civilization).